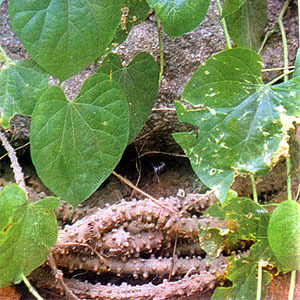 Makabuhay is a vine found throughout the Philippines. It contains a bitter principle, colombine, traces of an alkaloid, and a glucoside, berberine. The Filipinos and Malay in general consider this vine as a universal medicine. The name in Tagalog means “to give life.” It is commonly used for stomach trouble, indigestion, diarrhea, and ulcers. It is known as a febrifuge, and is said to have anti-malaria properties. Recent studies in the Philippines have found it useful as an insecticide for rice crops. Not for pregnant women, as can cause abortions. This entry was posted in List of Medicinal Plants in the Philippines and tagged makabuhay on March 22, 2009 by Pinoy Herbs. I would like to know where can we get these makabuhay plants? May I know where in the Philippines are these makabuhay plants plenty? You know I would like to share how this makabuhay plants work in me i mean in my life but of course God is my greatest healer. Before i took this herbal medicine I pray to God that this plant is just an instrument to cure my illness. I was diagnose of blood whitening and my situation gets worsen I was confined to hospital and and had several blood transfusion but still i didnt get well but weak and pale. I have also kidney problems and my diabetes almost agravate the situation but when i took this plant by 2 cups a day I get well until now im taking this and continually get well. where can i buy this plant tinosporo rumpii vine plants in californisa even on line order?